Two U.S. fighter jets crashed into the Pacific Ocean on Thursday while operating at sea, the Navy said Friday. 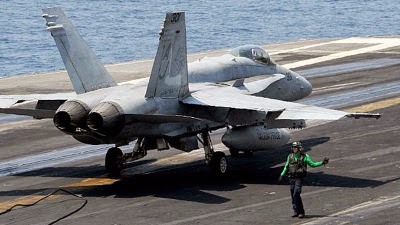 Two F/A-18 Hornets that were operating aboard the aircraft carrier USS Carl Vinson crashed in the western Pacific, the Navy said. One pilot was rescued and was being treated aboard the aircraft carrier. There was a search under way for the other pilot, the Navy said.